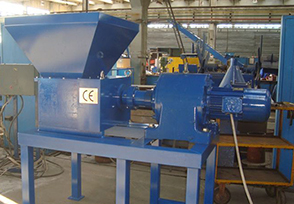 The dual-shaft shredders have been the market choice for recycling industries. These rugged industrial shredders can handle a wide variety of materials and are ideal for challenging applications that require a broad range of product output sizes. Our dual-shaft shredders are well-suited to stand alone operation or can be used for pre-shredding for further downstream processing. The Dual Shafts Shredder Kompass 1500/1100 is useful for size reduction of Plastic, Rubber, Cable, Tire waste, LDPE film bales with sizes suitable for processing into the shredder up to sizes needed for the consequent processing. The controller - type of plc, contactors, operators, lights, enclosure ... etc. Number of the Cutting Discs	30 pcs. Capacity per hour for passenger tires: About 6000 kg. Number of the Cutting Discs: 20 pcs. Capacity per hour for passenger tires: About 2500 kg. Cu and Al cables, WEE, Food waste, ... etc. for the next recycling processing. Cu and Al cables, WEE, etc. for the next recycling processing.